Chronic pain is a serious issue that affects millions of people worldwide. Although Opioids (pain killers) are thought to relieve the pain they are often associated with side effects. Researchers from the university of Arizona have made a breakthrough discovery wherein they found that exposure to green LED lights mitigates chronic pain. The principal investigators involved in the study are Drs. Mohab Ibrahim and Rajesh Khanna. They carried their experiments on three groups of rats suffering from Neuropathic pain. 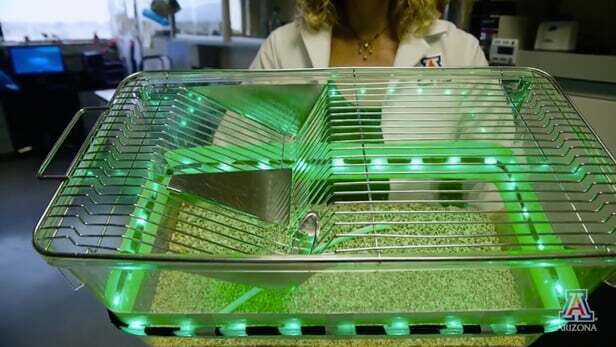 Group I - Rats are placed in plastic containers with green LED lights attached to them. So the rats were exposed to direct light for eight hours a day for a period of five days. Both Group I and Group II rats that were exposed to green light showed more tolerance for temperature and tactile stimulus when compared with rats fitted with opaque lenses. There were also no side effects observed in the rats and the pain relieving effect lasted for four days. Researchers say that, although the LED lights are responsible for pain relieving effects the mechanism by which it is done is not clear. They believe green light increases the level of natural circulating opioids (pain killers) in rats bodies and that may be the reason behind the pain relieving effect in rats. To check the effects of Green LED lights in humans researchers are conducting a small randomized double-clinical trial for 10 weeks in people suffering from fibromyalgia, a common source of chronic pain. So far the results are promising and the therapy worked well in both males and females.